A year ago in Vrindavin, Didi told me I needed to listen to as much harikatha as possible. There would come one word to me, she said, that from everything will blossom. But to receive that word I needed to listen to all harikatha that was spoken. During that trip I was “out of it”, struggling with spirituality and not really there mentally or physically. Then came those words from Didi. That was such a strange thing to say, right? I would receive ONE WORD that everything would blossom from. So I pressed her, what word? But she didn’t know. Just one word? Really? I put that statement in the back of my head, because you can’t really force something like that and you can’t push something to happen. And one word? Really? As if one word can change me? Well…. okey. I didn’t know what to make of it, but I was open. If she is connected, then it would come. So a couple of days later, the morning arrived with arti at KBM. Then afterwards I went to the arti of Yogamaya. If you have visited her, she is so beautiful. I told one of my friends this and she said “everybody loves yogamaya”. There is something so attractive about her. I’m not really that attracted to deities, arti and puja, but there is something about Yogamaya that touches me. I ended up sitting there for a while since the pujaris were late that day. As I was sitting there for myself, thinking about Yogamaya, the WORD came to me. I can’t help but think that Yogamaya wanted to give it to me. As soon as the stores opened up around 10am, I was outside one bookstore and immediately purchased “Art of Sadhana”. The word I was given was ART (which I have written about before, and before, ). Sadhana and spiritual progression is something I have long looked upon as an art, but of course, I keep on forgetting my own realizations. There was no room of forgetting now. Living is an art form. Spirituality is art. It’s the process of invention, not imitation. There is some rote memorization of verses, but progressing is a way of making this path our own. My path is not like yours. This is what this blog is about. When Didi gave me the order to share my realizations with the world, it’s a process of invention. Its a creative way of working through sadhana, its art. An art form. But art doesn’t just come flying from the sky, randomly hitting a bystander. It requires work, moving through life and changes. The levels and direction of inspiration changes as life changes. 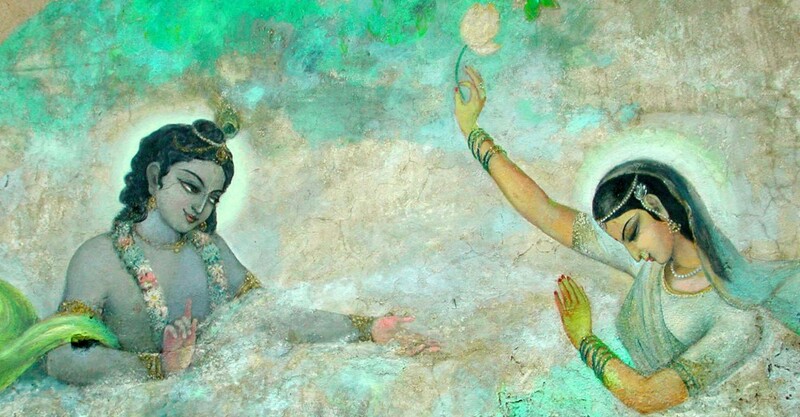 After my trip to Vrindavin and getting fired from my last job – and dealing with an obsessed psychopath, I just gave up. My whole life I have been pushing myself. My motto has been “never give up, never give in, never surrender” in how I deal with life. But by then I was so exhausted, completely wiped. I was done. With everything. I was done. So completely done. Being done transformed into apathy. I had pushed myself so hard through life, but the result was so meager compared to the effort I had put in. So I gave up and apathy took me. I have spent so many days with no energy, lying on the sofa where even moving my little finger was an effort. Then apathy which really is learned helplessness transformed into something more healthy. I stopped pushing myself, I put no demands on myself. Slowly I allowed myself to just BE. It was so healthy and good. It took a long time, but I slowly became a bit bored, which is fantastic. I’m almost never bored, but if I get bored it means I have created enough space in my life. It means that my default feeling of being overwhelmed was retreating. From boredom, creativity can begin to blossom again. That is where I am now. I am not gone. Writing a spiritual blog where I am supposed to share my realizations can’t be fake. If I have downtime, then that will show itself on this blog. If I struggle then silence will be a companion. Whenever progress has been made in my life, it seems to come in waves. There is a long period of seemingly standstill. Then suddenly things lift and it does so in many areas at once, like a wall has been breached and the wave spill over into so many different areas. The art of my life required that I learned to not push, to not demand something of myself all the time. It seems like I’m now entering a state where I connect differently. Live my life differently, and it’s a more healthy way of being. Among his various possible beings each man always finds one which is his genuine and authentic being. The voice which calls him to that authentic being is what we call “vocation”. But the majority of men devote themselves to silencing that voice of vocation and refusing to hear it. They manage to make a noise within themselves … to distract their own attention in order not to hear it; and they defraud themselves by substituting for their genuine selves a false course of life.